It used to be that we would only ride if the weather were at least 55 degrees. We’re also skiers, so when we thought about it, if we go out to ski in the cold, why not go out to cycle too? So, we started dressing better for the cold and for the last several years, we make it a point to ride at least once in every month of the year. That can be a challenge for those of us who live in the Northeast. Well, there was that really cold February a few years back. Since we were only riding on the weekend then, it was extra challenging. It was so cold out! But we did have an opportunity to ride on February 28th – sure it was 25 degrees out, but there was no ice on the roads. So we bundled up and made it for five miles before dragging our frozen butts back inside. Our friends said that the ride should only count if we were riding longer than it took us to get bundled up for the ride. Well, at least we said that the ride counted! We once heard that if you are warm at the start of a ride, you are overdressed. We find this to be very true. You will warm up fast as you start exercising. Dress in layers. It’s most important to keep your core warm, so wear multiple layers on your upper body. The number of layers you use will depend on the weight of them, but for a 40 degree ride, we will usually wear four layers. (We wear three layers for a 50 degree ride and two for a 60 degree ride.) We tend to wear a little less if the sun is shining strong. Layers with zippers are best as you can open them up for temperature control. For the legs, wear a pair of bike shorts with a warm pair of leggings over them. You can add a second layer on your legs if desired. Manage your sweat. The problem with overdressing is that you will sweat, which will get you wet, and being wet in the cold is a sure way to freeze! If you are someone who tends to sweat a lot, make sure the clothing you are wearing is breathable enough. Even jackets that say they are breathable may not allow enough air flow for you to sty dry. Try out different things to see what works best for you. For us, it’s a lot more comfortable to ride if our hands and feet are warm. We use Bar Mitts for the captain and heavy gloves for the the stoker. Thermal shoe covers are OK, but if you are serious about riding in the cold, invest in a really good pair of cycling boots. We love our Lake boots. A good pair of wool socks also helps a lot. Make sure that your head is warm. I like to wear ear muffs, but a thermal headband or hat also work. Also, check out the Cat-Ears solution. A recent tip a friend told us is to wear your ski helmet instead of your bike helmet. We tried it once on a really cold day and it was great! We tend to plan shorter, hillier rides in the cold weather. Tackling the hills is a great way to stay warm and get the most out of a shorter workout. Mountain biking is great for cold weather riding. It’s generally much more aerobic and will keep you warmer. Lower speeds keep the windchill factor down. 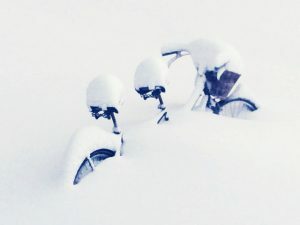 Not that we do this, but consider exercising (maybe riding a trainer) before going to ride outside. This way you can be warmed up before hitting the frigid weather. Be prepared to shed layers before you get overheated. Make sure that you bring along a way to carry any layers that you might want to shed. If it is below freezing be mindful of black ice! Use lights and wear bright clothing! It’s winter and cars don’t really expect you to be out there, so make sure you are visible. Be sure to stay hydrated. You won’t feel like drinking as much as on a hot day, but it’s really important that you do. We like to have a destination when we ride and often take a break for a hot cup of cocoa, tea or coffee and a snack midway through the ride. Remember, you burn more calories in the cold weather! It doesn’t hurt to keep a journal or notes on how you dressed for each weather challenge. This way after a year goes by you can look up how you dressed last year and what worked for you then. Dressing right makes all the difference when riding in the cold. Keep safe and warm out there!